TLC for Kids Miami is happy to provide hotel babysitters in the South Miami area. Our sitters are thoroughly screened and interviewed by our professional staff. If you are traveling to Miami or Fort Lauderdale this holiday season give us a call at 305-256-5905. Watch for TLC In the News! KMOV News 4 This Morning. Emily’s segment is appearing every morning between 6:30-7:00 a.m this week as she offers tips on staying organized during the morning routine. Are you looking for a nanny job? Being a nanny is a fun and rewarding career. Taking the time to find the right job for you will make the job even more fun! Finding the right job requires you to do a little bit of homework. It is your responsibility to review the job description and have a complete understanding of your responsibilities before accepting a position. There a few steps to follow to make sure the nanny job is a good fit. The first step in finding a great nanny job is to review the family job description. The job description is your first opportunity to see what the job entails. Look at things like location, hours, and salary. Do all those fit your requirements? The second step is the phone interview. Phone interviews are your first impression. Make sure you can talk without being distracted. Tell the family a little bit about yourself. Be prepared to answer some questions about your job history and experience. A face to face interview is your opportunity to shine. Arrive early, dress comfortably but professionally, and be prepared. You will be asked to answer questions but it is also your chance to ask questions. You will also have the opportunity to meet the kids. Take this opportunity to interact with the kids and show off how well you work with kids. Find out as much as your can about the family and the job. Would you like to work for this family? Do you agree with their child care philosophy? Are you comfortable in the house? After the interview thank the family for their time and make sure to follow up with a nice note. This extra step goes a long way. Following these steps will help you find a great job that you will want to stay with for years! If you are interested in a nanny job or want to learn more about being a nanny visit the TLC for Kids website. Flu season is quickly approaching! Peak flu season is from November through March. Flu Facts: ~Five to twenty percent of the US population get influenza each year. ~More than two-hundred thousand patients are hospitalized each year resulting in around twenty-thousand deaths. ~Patients at highest risk are young children, pregnant women, patients with chronic medical conditions (diabetes, heart and lung disease) and those over age sixty-five. Flu Vaccine Myths: “The flu shot made me sick” – The vaccination cannot cause flu. The virus is killed or weakened during the manufacturing process. You may have been exposed to a non-flu virus or to the flu prior to the vaccine taking effect. “I’m healthy, I don’t need a vaccination” – Even healthy patients can spread the flu to a grandparent or child, placing them at high risk for complications. “The shots aren’t safe” – Allergic reaction to the flu shot is very rare. Patients with a history of severe egg allergy or prior reaction should not get the vaccine. The possible risk of Guillen-Barre Syndrome is one to two per million vaccinated which is much lower than the risk of severe influenza. “It’s too early for the flu shot” or “It’s too late for the flu shot” – The US Center for Disease Control recommends getting the flu shot as soon as available. Flu season is unpredictable and starts early some years. Cases of influenza can occur as late as May, so late vaccination can still be protective. Contact your physician’s office for information about availability of the vaccination. If your physician’s office does not carry the vaccine, it is given at local pharmacies. TLC for Kids was one of the first agencies in the country to offer sick childcare. Our professionally screened sitters can come to your house and care for your sick child. You can go to work with the assurance that your child is in good hands. Our emergency service is open after hours until 9:30pm and early in the morning to answer your calls and set you up with a great babysitter. The TLC emergency service is one of the many ways we are here to help you with all your childcare needs. Are you planning a family vacation to South Florida? There are a few things you need to remember when preparing for a family vacation to the beaches of Miami or Fort Lauderdale. 1. Find a family friendly resort. Hotels like The Fontainebleau, The Ritz Carlton Key Biscayne, and The Lowes Hotel are great places that both your and your kids will love. 2. Bring swimsuits, hats and sunscreen. One of the great things about visiting South Florida is the weather. You can enjoy a day at the beach year round! 3. Plan some rainy day activities. There are lots of fun things to do besides going to the beach. Check out the Jungle Island, The Miami Children’s Museum, and Butterfly World. 4. Set a Date Night. Just because you are on a family vacation doesn’t mean mom and dad don’t need a night out. Contact TLC for Kids Miami for a hotel babysitter in South Florida. Our sitters are experienced, screened and available to come to the hotel. 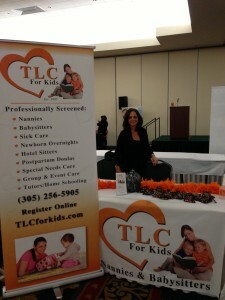 TLC for Kids Miami had a great time at the Southern Florida Concierge Association Vendors Fair. 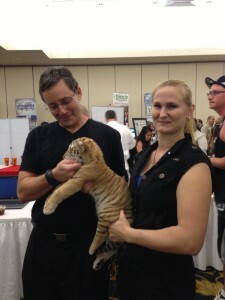 Gregg Radell from TLC for Kids Miami petting a baby tiger. Sharon and Gregg enjoyed the event at the incredible Miami Jungle Island. In attendance at the event were tourism vendors, concierges and hotel guest service employees from some of Miami’s finest hotels. TLC was able to meet with representatives from the The Ritz Carlton Miami Beach, The Trump Hollywood, The Doral Intercontinental, and The Fontainebleau. We told them all about our South Miami and Fort Lauderdale Hotel Babysitting Service. Along with the hotels representatives from some of Miami’s best restaurants and transportation services were there. The Jungle Island is a fun and scenic Miami venue and attendees were able to pet a baby tiger, a baby kangaroo, and of course the famous “parrot jungle” birds were in attendance. To learn more about Hotel Babysitting in Miami or Fort Lauderdale visit tlcforkids.com/Miami or give us a call at 305-256-5905.